The Bulgarian cabinet nominally headed by Plamen Oresharski tabled its resignation in Parliament shortly before 6pm on July 23 2014. It is probable that the resignation of the cabinet, which has been in office since May 2013, will be voted on in the National Assembly on July 24 or, at the latest, July 25. A statement on the website of Bulgaria’s Parliament said that the resignation had been lodged at the parliamentary administration office at a minute before 6pm. Earlier, the cabinet held what would be its penultimate meeting, with a further and final one scheduled for July 30. At its scheduled weekly sitting on July 23, the government reportedly discussed the issues of naming Bulgaria’s European Commission nominee and building a new unit at the Kozloduy nuclear power plant. Neither topic was on the cabinet agenda posted on the government website, but deputy prime minister Daniela Bobeva confirmed after the cabinet sitting that the issues had been discussed. 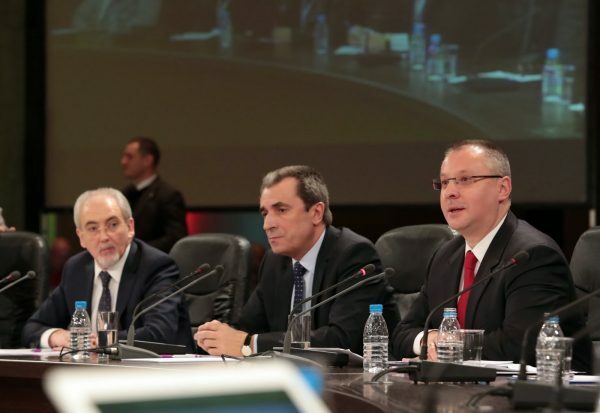 On the new nuclear reactor, the decision was left to the “next government”, Bobeva said; she declined to give any details on the discussion concerning Bulgaria’s EC nomination. Head of state President Rossen Plevneliev has said he will announce a caretaker cabinet on August 5, the National Assembly will be dissolved the following day and Bulgaria will hold early parliamentary elections on October 5. News of the resignation, which had been long awaited but with no clarity – apparently even among members of the cabinet – about when it would be tabled, came as a small crowd of anti-government protesters gathered outside the government offices in Sofia, in a protest to mark the anniversary of a night of violence when a busload of MPs was sent towards a huge crowd of protesters demanding the government’s resignation. The “Oresharski” cabinet was appointed at the end of May 2013 on the basis of a mandate to govern that had been handed to the Bulgarian Socialist Party, which had run second in early parliamentary elections but got the chance to govern because centre-right GERB, which got the most votes, had no allies in the 42nd National Assembly with which to form a government. The government, supposedly made up of “experts” – a claim that the opposition and anti-government critics greeted with derision – was voted into office with the backing of the Movement for Rights and Freedoms and with the tacit support of far-right ultra-nationalists Ataka. Movement for Rights and Freedoms leader Lyutvi Mestan, left, Plamen Oresharski, and BSP leader Sergei Stanishev. When, on June 14 2013, the ruling axis voted controversial figure Delyan Peevski to head the State Agency for National Security, there was widespread public outrage, leading to daily public protests which in their initial months drew tens of thousands of Bulgarians demanding that the government step down to make way for early elections. After autumn, turnout for these protests dwindled but the more reliable public opinion polls showed that the majority of Bulgarians wanted the cabinet gone. 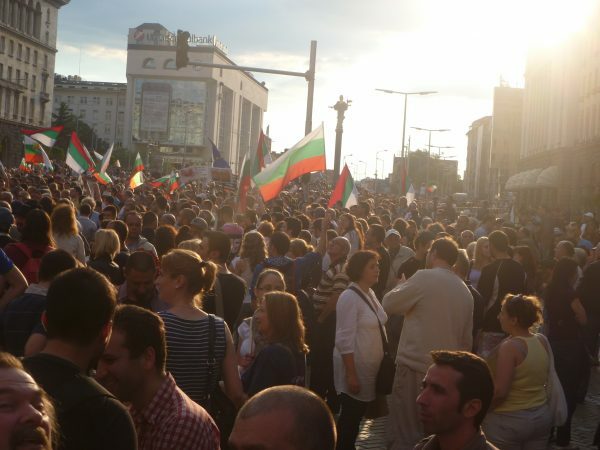 The July 23 letter of resignation by the cabinet comes close to two months after Bulgaria’s May 25 2014 European Parliament elections, in which Boiko Borissov’s GERB scored a resounding victory over the BSP. The BSP’s performance was so dismal that it ended up with the same number of MEPs – four – as its coalition partner the MRF, which for years has run third in elections. The denouement began after the MRF said that the cabinet could not serve its full term and there would have to be early elections. The BSP conceded and, amid turbulence in the ailing party, its leader Sergei Stanishev announced that he would step down so that a special party congress on July 27 could elect a new leader. Reneging on an oft-repeated promise during the campaign before the European Parliament elections, Stanishev resigned as a member of the National Assembly to take up his seat as an MEP. In an interview several days before the resignation of the cabinet, Oresharski said that he would not return to politics. Several years ago, he was a centre-right politician but in a Stanishev BSP-led cabinet from 2005 to 2009, Oresharski was finance minister.